July's guide is below. Hoping for clear skies for the eclipse. At the start of the month, the Sun rises at 04:55 and sets at 22:00. By month's end, it rises at 05:35 and sets at 21:25. 9th pm Venus and Regulus (Alpha (α) Leonis, mag +1.4). Mercury is at greatest eastern elongation on the 12th and is visible in the evening sky for the 1st half of the month. It sets at 23:15 and is mag +0.0 at the start of the month in Cancer. Venus is visible in the evening sky during the month. At the start of the month, it sets at 23:55. At month’s end it sets at 22:35 and brightens from mag -3.9 to mag -4.1 during the month. It is in Leo during the month. Mars is at opposition on the 27th in Capricornus. It becomes a late evening object by month’s end. At the start of the month, it rises at 00:05. At month’s end, it rises at 22:05 and brightens from mag -2.2 to mag -2.8 during the month. Jupiter is an evening object this month in Libra. It sets at 02:05 at the start of the month and by month’s end, it sets at 00:05. It fades from mag -2.2 to mag -2.0 during the month. Saturn is an evening object in Sagittarius during the month. At the start of the month, it sets at 04:45 and by month’s end, it sets at 02:40. It fades from mag +0.0 to mag +0.2 during the month. Uranus is at western quadrature on the 25th and is a morning object in Aries during the month. At the start of the month, it rises at 01:40. By month’s end it rises at 23:40. It maintains its brightness at mag +5.8 during the month. Neptune is in Aquarius and becomes a late evening object by month’s end. At the start of the month, it rises at 00:35. By month’s end, it rises at 22:35. It brightens from mag +7.9 to mag +7.8 during the month. The last quarter moon is on the 6th (08:51). The new moon is on the 13th (03:48) with the first quarter moon on the 19th (20:52). The full moon is on the 27th (21:20). There is a lunar eclipse on the 27th. The moon will rise after mid-eclipse, but should be a red/orange colour when it is rising. Moonrise is at 21:26 and the umbral phase will end at 22:13. After this the red/orange colour will start to disappear until it is completely gone by 23:19. Mars will rise to the South of the eclipsed moon. 1st am the 93% waning gibbous lies N of Mars at 01:00. 4th am the 73% waning gibbous lies SW of Neptune at 01:00. 7th am the 42% waning crescent lies SW of Uranus at 03:00. 8th am the 32% waning crescent lies NE of Uranus at 03:00. 10th am the 13% waning crescent lies NW of Aldebaran (Alpha (α) Tauri, mag +0.9) and S of M45 at 04:00. 14th pm the 5% waxing crescent lies NW of Mercury at 22:00. 15th pm the 11% waxing crescent lies W of Venus and N of Regulus (Alpha (α) Leonis, mag +1.4) at 22:00. 16th pm the 20% waxing crescent lies NE of Venus at 22:00. 19th pm the first quarter moon lies N of Spica (Alpha (α) Virginis, mag +1.0) at 22:00. 20th pm the 61% waxing gibbous lies NW of Jupiter at 22:00. 22nd pm the 79% waxing gibbous lies NW of Antares (Alpha (α) Scorpii, mag +1.0) at 22:00. 24th pm the 92% waxing gibbous lies NW of Saturn at 22:00. 25th pm the 97% waxing gibbous lies E of Saturn at 22:00. 30th pm the 92% waning gibbous lies W of Neptune at 23:00. The best time to observe meteor showers is when the moon is below the horizon; otherwise its bright glare limits the number you will see especially the fainter ones. Below is a guide to this month's showers. The Southern Delta Aquarids peak in the morning of the 28th. The ZHR is 25 and the radiant is visible from about midnight on the evening of the 27th. Very poor observing conditions as the peak clashes with the full moon in Capricornus. There may be additional minor showers this month, details of which can be found in the below Information Sources and Links Section. Asteroid (88) Thisbe is at opposition on the morning of the 20th at mag +9.7 in Sagittarius. It is visible between midnight and 03:00 on the night of the 19th/20th. Finder charts and further information about other fainter asteroids can be found in the below Information Sources and Links Section. Comet 21P/Giacobini-Zinner is a circumpolar comet which is predicted to peak at mag +7 in September. It is currently mag +12 with predictions of mag +9 by the end of July. It starts the month in Cygnus, moving into Cepheus and then into Cassiopeia by month’s end. It passes close to Zeta (ζ) Cephei, mag +3.5 on the night of the 14/15th and is near M52 between the 25th and the 27th. Comet C/2017 S3 (PanSTARRS) should be visible until early August when it is predicted to reach mag +6. It is currently mag +12 and visible all month as soon as darkness falls with it getting higher in the sky as the night goes on. It starts the month in Perseus, moving into Camelopardalis and then into Auriga by month’s end. Finder charts and further information about the above and other fainter comets can be found in the below Information Sources and Links Section. Any of the above estimates are based on current information at the time of writing the guide and can be wrong - “Comets are like cats; they have tails, and they do precisely what they want”, David H Levy. On the deep sky front this month, galaxies M81 and M82 can be observed in Ursa Major. Check out the constellation Canes Venatici with the globular cluster - M3 and several galaxies including M51 - the Whirlpool Galaxy and M63 - the Sunflower Galaxy. In Hercules, two globular clusters - M92 and the excellent M13 can be observed and in Lyra - M57 - The Ring Nebula can be observed. In Vulpecula - M27 - The Dumbbell Nebula can be found. In Andromeda, M31 - The Andromeda galaxy can be observed along with its satellite galaxies M32 and M110. In Perseus, there is the open cluster M34 and the excellent Double Cluster. Finally in Triangulum, there is the galaxy M33. Always keep an eye out for Aurorae. The night sky does not get fully dark this month. Between May and the middle of August, Astronomical twilight is present at night. This is when the sun is between twelve and eighteen degrees below the horizon. This time of year is very good for observing the numerous satellites and other objects in orbit above us. Watch out for NLCs - Noctilucent Clouds during July. Look to the North-West for a white/silvery glow 1.5 - 2 hours after sunset and to the North-East a similar amount of time before sunrise. They can sometimes be faint, sometimes bright. Other interesting naked eye phenomena to look out for include the Zodiacal Light and the Gegenschein. Both are caused by sunlight reflecting off dust particles which are present in the solar system. The Zodiacal Light can be seen in the West after evening twilight has disappeared or in the East before the morning twilight. The best time of year to see the phenomenon is late-Feb to early-April in the evening sky and September/October in the morning sky - it's then that the ecliptic, along which the cone of the zodiacal light lies, is steepest in our skies. The Gegenschein can be seen in the area of the sky opposite the sun. To view either, you must get yourself to a very dark site to cut out the light pollution. When trying to observe either of these phenomena, it is best to do so when the moon is below the horizon. A new appendix has been added explaining some of the more technical terms used in the guide. The ZHR or Zenithal Hourly Rate is the number of meteors an observer would see in one hour under a clear, dark sky with a limiting apparent magnitude of 6.5 and if the radiant of the shower were in the zenith. The rate that can effectively be seen is nearly always lower and decreases as the radiant is closer to the horizon. The Zenith is the overhead point in the sky. The radiant is the point in the sky, from which (to a planetary observer) meteors appear to originate, i.e. the Perseids, for example, are meteors which appear to come from a point within the constellation of Perseus. When the radiant is quoted as "circumpolar", it is never below the horizon and visible all night, otherwise the times quoted are when the constellation in which the radiant lies rises above the horizon in the East. A fireball is defined by the International Astronomical Union as a meteor brighter than any of the planets, i.e. magnitude -4 or brighter. The International Meteor Organisation alternatively defines it as a meteor which would have a magnitude of -3 or brighter at the zenith. The full moon’s width when viewed from the Earth is 30 arc minutes or ½ a degree. This should give an idea for judging any distances quoted in the guide. An asterism is a collection of stars seen in Earth's sky which form simple patterns which are easy to identify, i.e. the Big Dipper. They can be formed from stars within the same constellation or by stars from more than one constellation. Like the constellations, they are a line of sight phenomenon and the stars whilst visible in the same general direction, are not physically related and are often at significantly different distances from Earth. A conjunction is when two objects appear to be close to each other in the sky according to the perspective of the observer. Mag is short for magnitude which is the measure of an object's brightness. The smaller the number, the brighter the object. The brightest object in the sky is the Sun at mag -26, the full moon is mag -12 and Venus the brightest planet is mag -4. The brightest stars are mag -1. If there is a 1 mag difference between two objects - there is a difference in brightness of a factor of 2.5 between the two objects. For example the full moon is eight magnitudes brighter than Venus on average which means it is 1,526 times brighter than Venus. Objects down to mag +6 can be seen with the naked eye under very dark skies. Local time is always quoted in the guide and this means for November - February - universal time (UT)/GMT is used and for April to September - daylight savings time (DST, = GMT+1). For the months of March and October when the clocks go forward/back respectively, both times will be used and attention should be paid to any times at the end of these months for that change. Deep Sky Objects such as galaxies, nebulae and star clusters are classified in catalogues such as the Messier catalogue for objects like M44 - M for Messier. Another example of a catalogue would the New General catalogue whose objects have the prefix NGC. There are links for websites to both catalogues in the section above. Perihelion is the point in the orbit of a planet, asteroid or comet where it is at the nearest point in its orbit to the sun. It is the opposite of Aphelion, which is when the object is at the farthest point in its orbit from the sun. For the earth, the comparative terms used are perigee and apogee and for the moon, pericynthion and apocynthion are sometimes used. From Earth - Mercury and Venus are the inner planets in the solar system and Mars, Jupiter, Saturn, Uranus and Neptune are the outer planets. Below is a short guide as to how both the inner and outer planets move around the sun. The above pictorial guide should hopefully help in this. These are best seen when at Greatest Eastern/Western elongation and are not visible when at either Inferior/Superior conjunction. Greatest Eastern elongation is when the inner planet is at its furthest point east from the sun as seen from Earth and visible in the evening sky in the West after sunset, Western elongation is when it's at its furthest point west from the sun as seen from Earth and visible in the morning sky in the East before sunrise. Inferior conjunction occurs when the inner planet is between the Sun and the Earth. Superior conjunction occurs when the inner planet is on the other side of the Sun as seen from Earth. From our Northerly latitudes, the ecliptic, along which the planets move, lies at a very shallow angle to the horizon after sunset in the autumn and before sunrise in the spring. This means that any of the planets will be difficult to see when fairly close to the Sun in the evening sky in the autumn or in the morning sky in the spring. In particular, Mercury is more or less invisible from here when at Eastern elongation in the autumn or at Western elongation in the spring, because it lies so close to the horizon and is never above the horizon except in daylight or bright twilight. 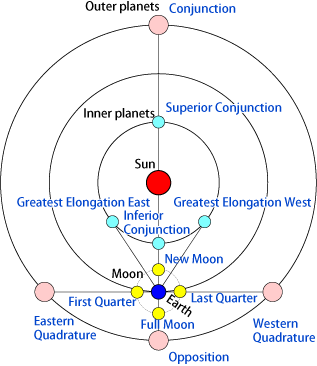 The normal cycle for an inner planet is Superior Conjunction - Greatest Eastern Elongation - Inferior Conjunction - Greatest Western Elongation - Superior Conjunction. After superior conjunction, the planet moves away from the Sun as seen from Earth and becomes visible in the evening sky after a period of time. It then moves past the point of Greatest Eastern Elongation and moves back towards the Sun as seen from Earth until a point when it is not visible and at Inferior Conjunction. After this the planet appears in the morning sky for a time, before again slipping into the Sun's glare as seen from Earth. The duration of this cycle will depend on the planet's closeness to the Sun, i.e. Mercury completes the above cycle in around 4 months. These are best seen when at opposition and are not visible when at conjunction. Opposition occurs when the earth is between the sun and the outer planet. It is the best time to observe them because the planet is visible all through the night and it is due South and at its highest at about midnight. The planet is also at its closest point in its orbit to Earth - making it appear brighter. Conjunction occurs when the outer planet is on the other side of the Sun as seen from Earth. If the planet is at or near it furthest point South along the ecliptic, then it won't get very high in the sky even at opposition - just as the Sun never gets high in the sky in midwinter. This happens when opposition occurs near midsummer when the planet is opposite the Sun in the sky and in midsummer the Sun is high, so the planet will be low. The opposite of course applies in winter. The normal cycle for an outer planet is Conjunction - Western Quadrature - Opposition - Eastern Quadrature - Conjunction. After conjunction, the planet moves away from the Sun as seen from Earth and becomes visible again. The planet from this point on rises earlier and earlier in the morning sky and eventually becomes visible in the evening sky. At Western Quadrature it is at its highest at sunrise and by opposition it is in the same position by midnight. By Eastern Quadrature, it is past its best and is at its highest at sunset, meaning it is rising in daytime and setting earlier and earlier until a point when it sets too close to the Sun as seen from Earth and is no longer visible. The duration of this cycle will depend on the planet's closeness to the Sun, i.e. Jupiter completes the above cycle in around 13-14 months. Linda: "All in all, this is one day Mittens the kitten won't soon forget." Morbo: "Kittens give Morbo gas." Comet C/2017 S3 (PanSTARRS) has gone into outburst and brightened from mag +12 to mag +9. Neill wrote: Comet C/2017 S3 (PanSTARRS) has gone into outburst and brightened from mag +12 to mag +9. Easily visible in the 8SE last night Neill, quite diffuse so the usual difficulties with mag estimation. I'd go for +9.5. "The gas cloud around the comet's nucleus is about 4 arc minutes wide," says Jäger‎. That means the comet's atmosphere is 260,000 km in diameter, almost twice as wide as the planet Jupiter. One report had C/2017 S3 as bright as mag 6.9 last night, as a second outburst continues. Not clear enough in that part of the sky for me, and tonight looks clouded out everywhere. Thanks for the report. It will be visible until early August. Latest reports suggest the 2nd outburst is over. Brightness being estimated back at mag +8. Neill wrote: There is a lunar eclipse on the 27th. The moon will rise after mid-eclipse, but should be a red/orange colour when it is rising. Moonrise is at 21:26 and the umbral phase will end at 22:13. After this the red/orange colour will start to disappear until it is completely gone by 23:19. Mars will rise to the South of the eclipsed moon. 'Another band of showery rain will extend from the Atlantic during Friday afternoon and evening...' Doesn't sound promising. Aye, looks like the curse of the Irish astronomer will strike again on Friday for the eclipse. I saw a forecast with clear skies arriving in the early hours of Saturday. Too late for the eclipse, it may change and we may get lucky. Have a look at Shannonside Astronomy Club Facebook. Frank Ryan and Dave Lillis have a superb 15 minute video recording as they observed the Lunar Eclipse from Barcelona.